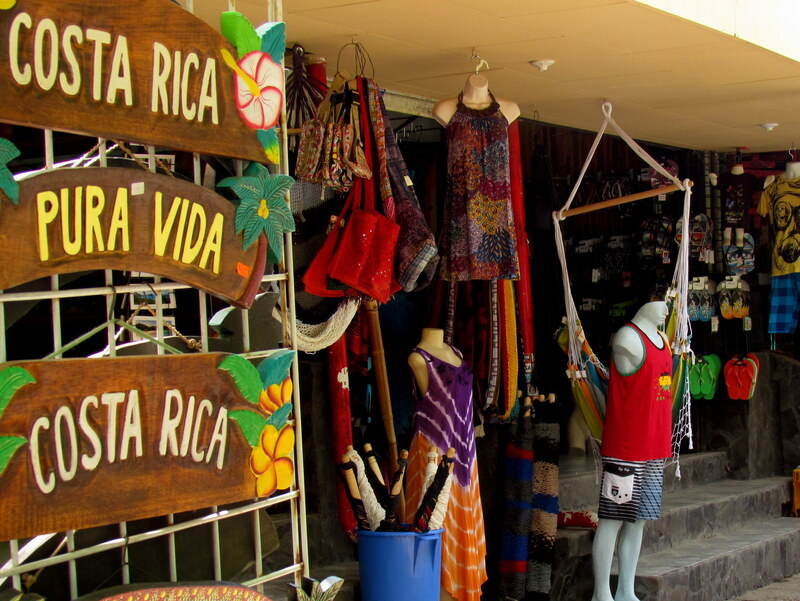 We get a lot of e-mails especially from budget travelers asking what there is to do for free in Costa Rica. Turns out not much is totally free, but if you stretch your budget to a few bucks per person it opens up more possibilities. Our list of cheap or free things to help keep kids entertained also might be worth a look if you’re young at heart. The right choice of destinations and lodging can also go a long way towards reducing the guided tour budget while still seeing a lot of Costa Rica. As they say “nothing in life is free,” but these suggestions are as close as you’ll come. You have to pay to walk through the rain forest or cloud forest on improved trails or in National Parks but checking out the hammock shops and souvenir stands in tourist towns or little church and a typical ferretería in an off the beaten path agricultural pueblo can be an interesting way to spend an afternoon. You might want to bring a few bucks for an ice cream cone or cold beer, but you can always categorize that as part of your food budget and call the stroll totally free. Some minor dirt and 4WD roads might be another good place to take a walk (paved roads can be quite dangerous for walkers, bikes and runners). Even though we’re typically out for exercise, running, and not being particularly quiet, we’ve spotted amazing amounts of wildlife on side roads. One of the best hiking roads we’ve found is in Monteverde. There’s a 4WD radio tower service road starting 50 meters northwest of the hotel Belmar that goes to the top of Cerro de los Amigos where you can stand on the USGS marker and be in Guanacaste, Alajuela and Puntarenas provinces all at the same time. When it’s clear there are fantastic views over the lake and all the way to Arenal Volcano. They aren’t exactly a substitute for trails through the rain forests in the national parks because any area that has road access has also been mostly clear-cut for pasture or farmland. There’s rarely shade and except for a couple of hours early in the morning or late in the afternoon the lack of tree cover can make it excruciatingly hot under the tropical sun. It’s worth taking a walk anywhere. One of the best wildlife spotting walks we ever experienced in Costa Rica was all on driveways. It wasn’t exactly free because you had to rent one of the $500 a night villas to get into the gated development but we put that in the lodging category not entertainment. 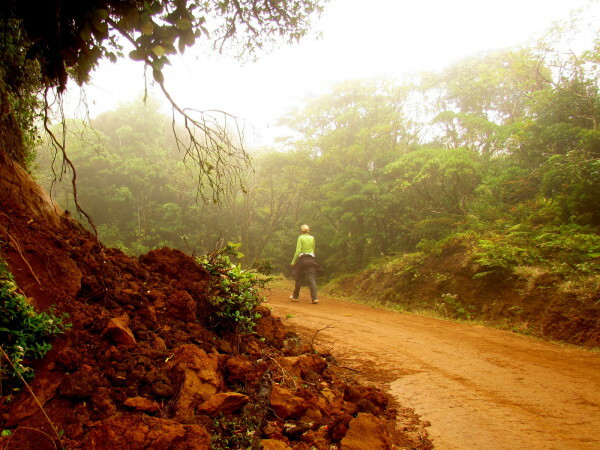 Many trails in Costa Rica come with entrance fees but there are some that don’t. It can be difficult to find the access points and to be certain you’re not trespassing so we don’t list many of them here. 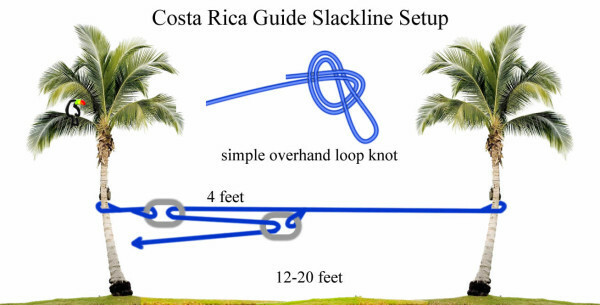 Instead we suggest you take a look at (and post questions on) some of the facebook pages dedicated to hiking in Costa Rica. Two good ones are Ruta la Cima and Picoaventuras Talamanca. On weekends you’ll frequently find locals picnicking and swimming anywhere a road meets a river. Especially where there’s a major bridge there’s often a small gravel access road down to a stream side beach and swimming hole. Natural swimming pools may include waterfalls, rocks and cliff jumping, rope swings (please be careful) and even hot springs. They’re almost everywhere and the easiest way to find the local one is just ask the locals. 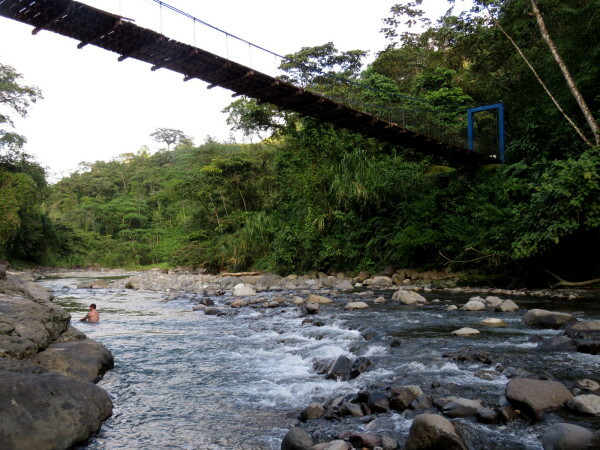 Some of our favorites are El Salto where the Río Fortuna crosses the road to Tigra south of La Fortuna Arenal, on the Río Toro east of Pital, Piscina Natural 1 km north of Cahuita, 1 km upstream from Dominical on the Rio Barú, the Río Claro 1 km north of Playa San Josecito on the Osa, Montezuma waterfall, the rope swing by the bridge on the Río Rincón 1 km west of La Palma on the Osa and too many others to mention. We’ve even swum in natural pools formed when lava tubes collapsed and the bottom half filled with water. In the northwest llanuras wide, deep rivers frequently flood into the surrounding lowlands making road building and maintenance difficult. 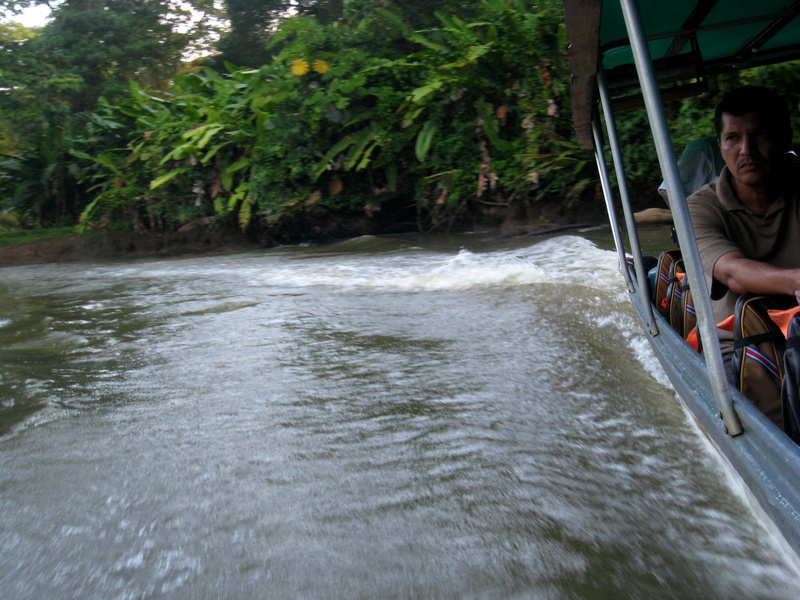 People turn to the rivers themselves for transportation and collectivo water taxis ply routes on the Sarapiquí, San Juan, Colorado, Frío, and Tortuguero rivers among others. A collectivo is sort of the boat version of a public bus or shared taxi and fares are typically under $5. Tourist versions that charge $25-$40 have evolved especially on the routes to Tortuguero from Moín, Caño Blanco or Pavona but other destinations are still quite cheap. One good dock for water taxi excursions is Los Chiles but our favorite ride was from Puerto Viejo de Sarapiqui to Trinidad on the Nicaraguan border. The other half dozen passengers kept making the captain pull up to the bank and idle while we took pictures of caimen, kingfishers, monkeys, sloth and other wildlife they spotted. Even though they were all locals who where just trying to get home after a shopping and banking excursion in Puerto Viejo no one complained that the two gringos doubled the time for the trip. Most likely you’ll want to make it a round trip and just enjoy a day on the river. The tiny communities along the routes don’t offer many lodging options for tourists and as we mentioned the tourist route to Tortuguero where lodging is plentiful is much more expensive. Pick the most middle of nowhere destination you can find within an hour of wherever you are and plunk down $1.50 for a round trip chicken bus ticket. 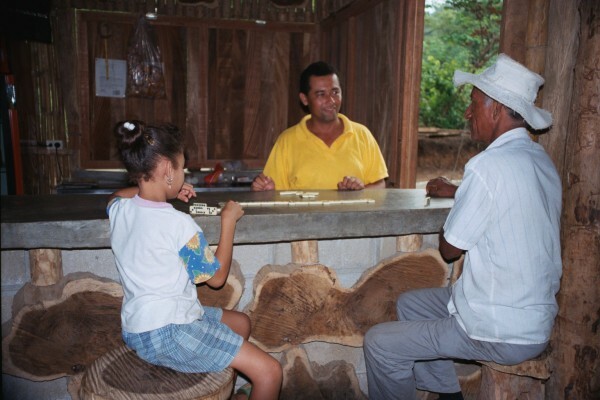 You may meet some real characters or see a tree full of toucans along the way. You may end up watching a soccer match, exploring a unique cemetery, or finding out what an old fashioned cattle roundup and branding is like. We can’t tell you where to go or what to expect – that’s why it’s called an adventure. If you’re reading this article about saving money on activities then you’re probably trying to save money on other things like transportation as well. Kill two birds with one stone and take a public bus. Not only is it interesting but public buses take quite a bit longer than a rental car or tourist shuttles so you won’t have so much free time left over to try to occupy. If you’re just learning (much easier than it looks) the best place is the beach over nice soft sand. Once you get the hang of it you can slack anywhere you can find two immovable objects 15 to 50 feet apart. It’s a great core workout that you can do in the shade and I guarantee it will help take your surfing to the next level. Slacking is meditative and relaxing and a unique way to meet people. Everyone is curious and most want to give it a try. There’s a small upfront investment (~$25 to $100 depending on set-up) but it lasts forever – I’ve still got the first line I bought almost 30 years ago. Any hobby old or new takes on a different aspect on the road – photography, writing, drawing, painting…. juggling and magic/card tricks are a couple of other things that are fun to learn and practice when you’re traveling. There are literally thousands of howto videos on YouTube. I carried an harmonica about 30,000 miles over a couple of decades before I finally put it away never having gotten much past “The Saints Go Marching In.” You might do better if you give it a shot. If you’ve got a lot of time on your hands another possibility is to get a “real” job. The pay is rarely good and usually barely enough to scrape by unless you have a work visa. Still, you might meet some fun people bar tending, or helping with surf board rentals. If you’ve got a month or two to kill instead of an afternoon consider seeking a volunteer position. It may not be easy but it can be rewarding. “So what is there to do around here anyway?” Who knows, you might even be asked to join a game of dominoes. 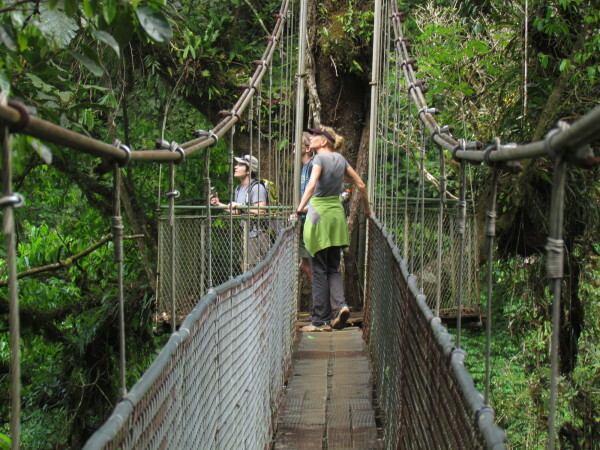 For example the photo above was taken on my favorite suspension bridge in all of Costa Rica. It’s on the huge private reserve of Heliconias Lodge outside Bijagua bordering Tenorio Volcano National Park. Last time we visited there with a couple of friends instead of going to Arenal. If we’d chosen Arenal we each would have paid $24 (unguided) for a daytime visit and another $47 (guide required and included) for a night time visit to the Arenal Hanging Bridges, plus $15 for the entrance fee to the National Park plus about $50 for transfers plus $35 each per night for a simple place to stay. A total of $280 for two nights lodging plus $394 for activities for the four of us. Instead we paid about $35 each to stay at Heliconias, walk out the door of our cabin to the bridges whenever we wanted day and night, and used their private trail to cross the reserve to Tenorio National Park and continue up to Lago Danta (which you can’t even reach from the main paid park entrance). A total of $280 for two nights lodging plus $0 for activities for the four of us. That’s an extreme example and the two experiences aren’t identical. Arenal Hanging Bridges is about 4 times larger (but also gets 50 times more visitors) and we did actually end up staying another night, going to the main entrance of Tenorio park and paying $15 to enter there and hike to the Celeste waterfall as well. Still it was less than half the price. If you can trick yourself into believing it you can carry this strategy to an extreme and book an All Inclusive Resort then pretend that the activities they offer are free rather than pre-paid. Somehow doing nothing works better on the beach than anywhere else. “I went to the beach.” – that’s it, the whole and totally satisfactory answer. Just going to the beach counts as doing something all on its own. You can jump into a pick-up futbol or volleyball match, walk for hours, reassemble a sea turtle skeleton, or maybe even go swimming. Some places to stay provide free beach cruiser bikes, boogie boards, snorkeling gear or other toys. If yours doesn’t rentals can be found for a few bucks a day. 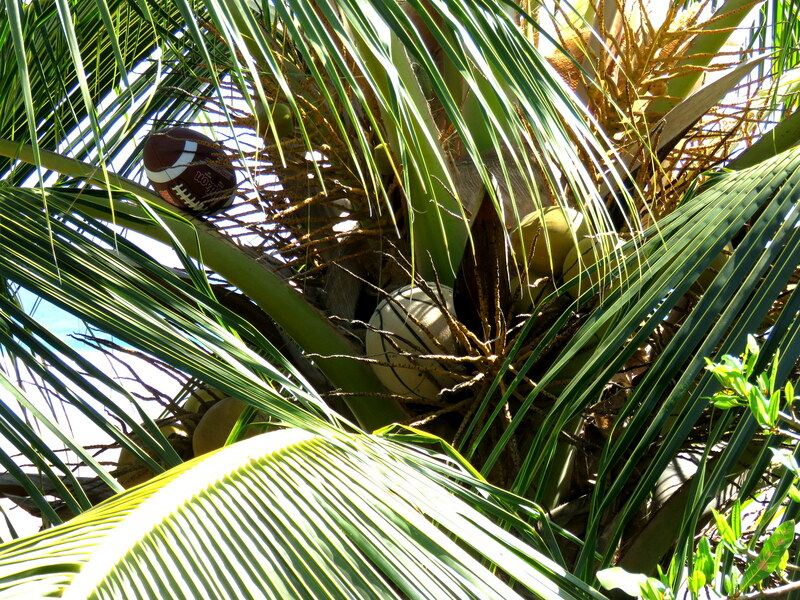 Recently three adults and three teenagers spent over an hour figuring out how to get a couple of fresh coconuts out of a tree and cut open so we could drink the water. Not because we didn’t want to give ¢500 to the pipa guy, but because it was entertaining. You certainly can spend money on tours and activities when you’re at the beach but the point is that it’s easy not to. If you’ve got a couple of extra days but no extra cash head to the coast and just do nothing.